Paul McGhee is a third year Title III HBGI Ph.D. Fellow in the Mechanical Engineering program. He is conducting his doctoral research at the National Science Foundation Engineering Research Center for Revolutionizing Metallic Biomaterials (NSF-ERC-RMB) at North Carolina A&T State University under the mentorship of Dr. Sergey Yarmolenko and Prof. Devdas Pai. His research supports the development of revolutionary new alloys for use in the human body as biodegradable implant materials. Specifically, Paul is investigating the effect of adding small amounts of other constituents (micro-alloying) and extrusion on the fatigue and corrosion behavior of the ERC’s novel magnesium alloys. Mr. McGhee is a proud member of the third class of HBCU All-Stars (2016-2017) for the White House Initiative on HBCUs, serving as an ambassador to promote the value of education and college completion. 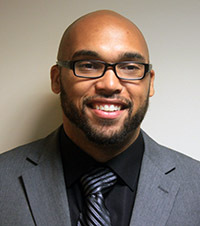 Paul holds several leadership positions for several campus professional and student organizations. Paul is the President, Technology Director, Education and Outreach coordinator, and Newsletter officer for the ERC-RMB’s Student Leadership Council, a member of the Education Advisory Board of A&T’s Bioengineering Degree Programs, the By-Law Chair for the Society for Biomaterials’ A&T Student Chapter, and the College of Engineering Representative for the Graduate Student Advisory Council (GSAC). In his spare time when away from academics, Paul enjoys weightlifting, basketball, football, reading, cooking, philosophizing, and 3D printing his own creative designs.